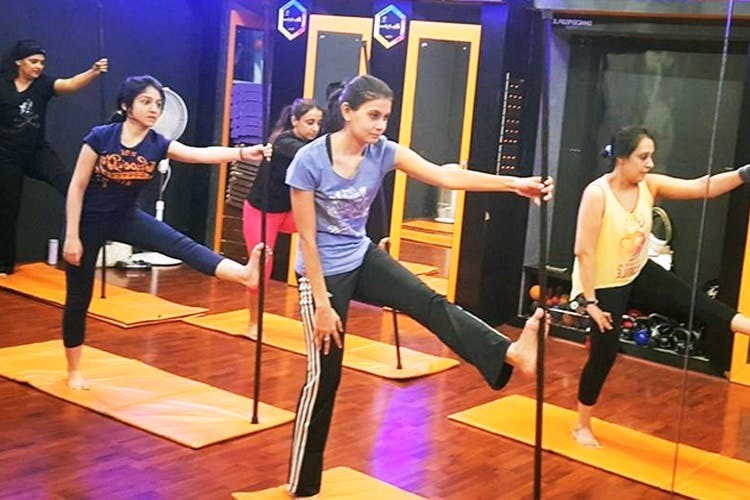 Skip the conventional workouts and instead sign up for exciting fusion workouts like pole dancing from Lavina Khanna in Khar. Lavina Khanna is an instructor who takes a bunch of different classes out of a studio in Khar. She teaches all sorts of workouts like zumba, tabata, and even yoga. However, we caught on an interesting way of working out with her and it’s pole dancing. Though pole dancing may not be seen as a workout form, Lavina believes pole dancing is a great way to work on your abdomen and strengthen it. By working primarily on the abdomen and the lower body, it works its magic on the bums, calves and waist. It’s a great one hour session of intense workout which is called ‘Lipstick workout’, one can easily burn up upto 800 calories. Plus as a bonus, you get to look sensuous and learn some amazing moves like shimmy, pop and grind and more. The unconventionality of the workout form. Pole Dancing when done right, can be fun and exciting. There’s a basic warm-up excersise which is then followed by ways of perfecting the technique. The classes are held over the weekends, and is for anyone who’s looking out for different ways to challenge themselves. It’s INR 1,000 per session, however, you can look at taking up membership with the studio on Fitternity here. If this is not jam, you could also sign up for trampoline power jumps on Fridays to get the fitness ball rolling. Stepping away from its exotic persona, we’re excited about pole dancing being seen as a fitness workout routine.